Three suspected Islamic State suicide bombers who killed 44 people in a gun and bomb attack at Istanbul's main airport this week were Russian, Uzbek and Kyrgyz nationals, a Turkish government official said on Thursday. The attack on one of the world's busiest airports, a hub at the crossroads of Europe and Asia, was the deadliest in a series of suicide bombings in Turkey this year. The official gave no further details beyond confirming the attackers' nationalities and declined to be named because details of the investigation have not yet been released. Forensics teams had been struggling to identify the bombers from their limited remains, officials said earlier. "A medical team is working around the clock to conclude the identification process," one of the officials said. Turkey's Hurriyet newspaper named him as Osman Vadinov and said he had come from Raqqa, the heart of Islamic State-controlled territory in Syria. The Russian interior ministry said it was checking information about Vadinov. A spokesman for Kyrgyzstan's state security service said it was investigating, while the Uzbek security service had no immediate comment. Turkish police detained 13 people, four of them foreigners, in raids across Istanbul in connection with Tuesday night's attack. Broadcaster CNN Turk said they were accused of providing logistical support for the bombings. U.S. Homeland Security Secretary Jeh Johnson said the Istanbul attack bore the "hallmark" of Islamic State and that one U.S. citizen had been slightly injured. Turkey's main opposition leader, Kemal Kilicdaroglu, angered by the ruling AK Party's refusal to hold an inquiry into the airport attack, accused the AKP of "an ideological kinship" with Islamic State. Government officials have flatly rejected such accusations in the past. 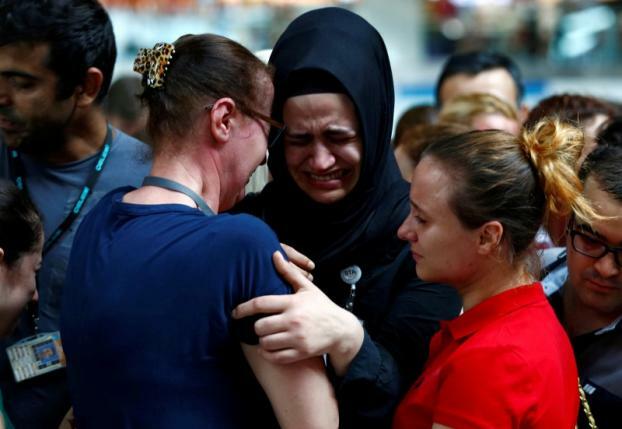 0 Response to "Istanbul airport bombers were Russian, Uzbek, Kyrgyz: Turkish official"